When it comes to comprehensive mobile, manufactured or pier & beam home leveling solutions or foundation repair solutions, depend on Top Notch Mobile Home Services based in Fort Worth, Texas, with branches in Houston, TX, and Leesburg, Florida. Trust us to provide the most competent leveling services and repairs, which are geared towards enhancing the value of your home. 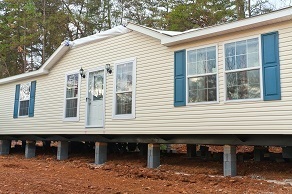 An FHA loan requirement, retrofitting provides a system concreted into the ground to level mobile homes. This is possible with the unleveled ground underneath. As part of our commitment to providing better pricing, we are currently offering a special $2,199 service fee on our retrofit systems. This complete manufactured home service can be applied to all types of mobile and manufactured homes and comes with a five-year warranty. Retrofitting which connects your frame to concrete is required by FHA and other loans. Contact us for our cost-effective foundation repair services.